Sarge Fiore and my dad were friends. They served on the Clairton police force together. So when their wives both had sons born within a few months of one another it was inevitable that Frank and I would be friends. I can’t remember a time we were not friends. We spent many hours at one another’s houses playing as little boys do, and when that scary time came that we left the house and went to school for the first time, I was relieved to see my buddy Frank. We were both slight in stature. Sarge taught Frank to box. I declined his offer to teach me as well. Frank was an excellent student, one of the top in the class. In fact, I remember as clearly as yesterday when we were in the third or fourth and our teacher put scrambled letters on the board. We were to make as many words as we could. Several students tied for the most words, but Frank broke the tie by using the letters to spell “canoe.” I couldn’t even say the word let alone spell it. When my first book was published, 50 Shades of Grades, My Journey Through Wacademia, Frank was one of the first to read it. The cover of the book was of our third or fourth grade class. Frank and I stood next to one another. 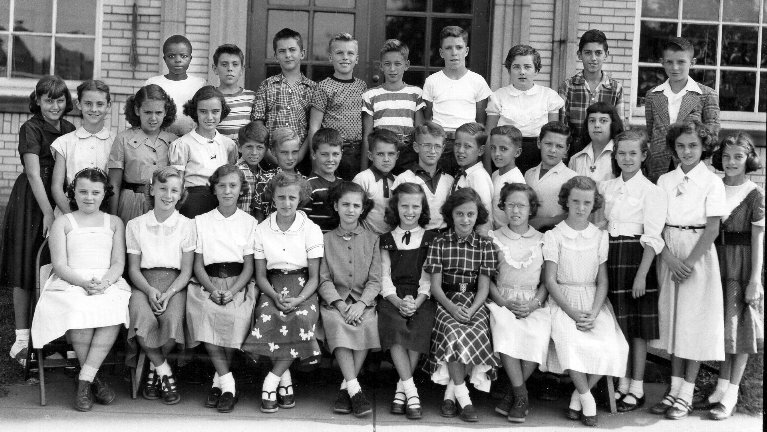 I named each of the students in the photo and Frank was quick to point out that I’d misidentified three or four of our classmates. He was meticulous. I had been emailing Frank regularly over the past three years as I reported progress on my latest book. My last email announced the completion of the book, but in return I received word that he had passed. His death falls under the “Life isn’t fair” category. Frank did everything right; did not smoke or drink, exercised regularly, and fit into his high school clothes even at our age. He was called too soon. May he rest in peace. It is with deep sadness that we report the death of our fellow classmate, Frank Fiore, on June 15, 2016. The following is Frank's obituary provided by his wife, Jeanne, via Andy Nixon. Frank William Fiore, 73, of Whitehall, formerly of Clairton, passed away surrounded by his loving family on June 15, 2016. He was born in Clairton, Pennsylvania on September 18, 1942, to Sarge and Jean Fiore. Frank is survived by his loving wife of 42 years, Jeanne Fiore. He is also survived by his two daughters, Kristin (Thomas) Rhad and Lauren (Chris) Byland, step-son, Mark Beck; grandchildren Gianna Rhad, Callen Byland, Sophia Rhad, and Tyler Rhad; and siblings Tricia (Lee) Alverson, Tom (Susie) Fiore, James (Arlene) Fiore, and brother in law to Elaine Averbeck, as well as many loving nieces and nephews. Frank was an Industrial Engineering graduate of Penn State University. He had a successful career, but was most devoted to his family. Family and friends will be received on Sunday from 2-4 & 6-8 PM at the Jefferson Memorial Funeral Home, 301 Curry Hollow Rd., Pleasant Hills, 15236. A Mass of Christian Burial will be conducted 10 AM at St. Gabriel of the Sorrowful Virgin. Condolences may be left at www.jeffersonmemorial.biz. It is with deep sadness that we report the death of our fellow classmate, Vicki Billy Trainor, on May 31, 2016. The following is Vicki's obituary. Victoria "Vicki" Trainor, AGE: 72, On May 31, 2015, (nee Billy) of Oaklyn, NJ and formerly of Lumberton, NJ, age 72. She is the beloved wife of John W. Trainor, loving mother of John W. Trainor Jr., Katie Trainor, Stacey Overbeck (Bryan), Maggie Angelitis (David) and dear grandmother of Brittney, Luke, Grant, Jaxon and Will. Vicki was a teacher for over 30 years and taught at Camden Catholic High School in Cherry Hill for more than 20 years. It is with deep sadness that we report the death of our fellow classmate, Dave Kunkel, on Thursday, March 20, 2014. The following obituary appeared in the Pittsburgh Tribune-Review. David Henry Kunkel, 71, of North Huntingdon, passed away Thursday, March 20, 2014, at home. He was born April 18, 1942, in West Mifflin, a son of the late Kenneth and Agnes (Blank) Kunkel. David was employed by River Lift Industries, West Elizabeth, as an equipment operator. He was a member of St. Agnes Parish and an Army veteran. David enjoyed feeding the squirrels and was an avid fisherman. In addition to his parents, he was preceded in death by his two infant daughters, Tracy and Kimberly; and sister, Kathy Jordan. He is survived by his wife of 45 years, Johanna (Balint) Kunkel; son, David and his wife, Amanda, of Frederick, Md. ; daughter, Melissa Seech and her husband, Nicholas, of Penn Township; brothers, Kenneth (Linda), of Elizabeth, James (Carolyn), of Finleyville, Charles (Debbie), of Monongahela, Dennis (Janet), of Jefferson Hills, and Gerald (Janet), of Elizabeth; brother-in-law, Donald; and five grandchildren, Brayden, Samantha, Madyson, Emily and Sadie Grace. Friends will be received 6 to 8 p.m. Sunday and 2 to 4 and 6 to 8 p.m. Monday at the JAMES W. SHIRLEY FUNERAL HOME, 176 Clay Pike, North Huntingdon. A funeral Mass will be held 10 a.m. Tuesday in St. Agnes Church, North Huntingdon. Interment will be in Penn Lincoln Memorial Park. In lieu of flowers, memorials may be made to Interim Hospice. http://www.shirleyfuneralhome.com..
Dee01. Dorothy Poziviak Martin submitted this picture and the next two. 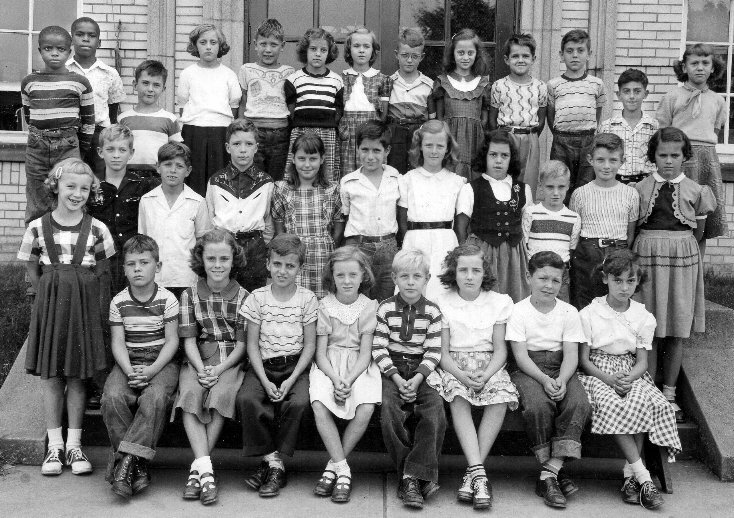 We might need your help in identifying everyone in the picture. Stay tuned. It is with deep sadness that we report the death of our fellow classmate, James B. Smith (Jim), on Wednesday, September 18, 2013. The following obituary appeared in the Pittsburgh Post-Gazette on Saturday, September 21, 2013. 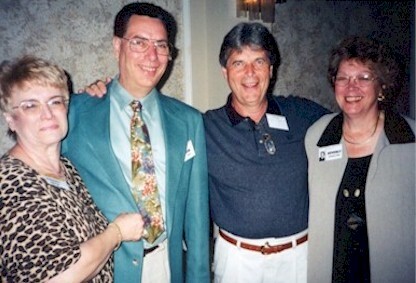 From our 40th reunion in 2000. L to R: Harriett and Jim Smith, Jack "Fish" Herring, Beverly Huffman Hibar. SMITH, JAMES B. (JIM) - Passed peacefully September 18, 2013, at age 70. He was the son of the late John and Minnie Henderson Smith; and brother of the late George and John Edward Smith. Jim was the beloved husband of Harriett Byers Smith, for 50 years; loving father of Jeffrey (Tricia Haugh); and grandfather of Tyler Smith. Mr. Smith spent many working years in the computer field and was a computer science teacher for CCAC, and an active member of the Masonic Lodge. Visitation will be held Saturday 6 to 8 p.m. and Sunday 2 to 4 and 6 to 8 p.m. at the JEFFERSON MEMORIAL FUNERAL HOMES, 301 Curry Hollow Rd., Pleasant Hills. The funeral service will be Monday at 11 a.m. at the Jefferson Memorial Funeral Home Chapel. Graveside Services will follow in Jefferson Memorial Park. It is with deep sadness that we report the death of our fellow classmate, Paul E. Bratton, on Friday, March 30, 2012. The following obituary appeared in the McKeesport Daily News. Paul E. Bratton, 70, of Clairton, passed away Friday, March 30, 2012, in his home. Born March 2, 1942, in McKeesport, he was a son of the late Walter J. and Elizabeth J. (Bollman) Bratton. Paul retired as a laborer for National Tube Works in McKeesport and also worked as a night janitor at the Carmike Maxi-Saver Theater in West Mifflin, a guard for St. Moritz Security and a night watchman for the former Bell Telephone. He was also a veteran of the Air Force. Paul is survived by his wife, Virginia (Geruschat) Bratton; his son, Paul J. Bratton, of Clairton; his daughter, Laurel E. Smith, of Yakima, Wash.; his sisters, Mary Landis, of Clairton, Margaret Kuhn, of Elizabeth, and Patty Lindlof, of Clairton; his brother, William Bratton, of Bethel Park; and also survived by nieces and nephews. Funeral services will be private at the request of the family. Arrangements are by the A.J. BEKAVAC FUNERAL HOME, 555 Fifth St., Clairton, 412-233-5700. Memorial contributions in Paul's name may be made to the family. www.bekavacfuneralhome.com. It is with deep sadness that we report the death of our fellow classmate, Al Sanutelli, on Wednesday, February 16, 2011. The following obituary appeared in the McKeesport Daily News. Albert M. Sanutelli, 69, of Clairton, died Wednesday, February 16, 2011, at Jefferson Regional Medical Center. Born September 25, 1941, in Hamilton, Ohio, he was a son of the late Mario and Betty (Cowgill) Sanutelli and the husband of Monica (Ehrhardt) Sanutelli. Albert was a local painter for over 35 years and a U.S. Navy veteran serving in Vietnam and a past member of the former St. Paulinus Catholic Church in Clairton. In addition to being a loyal Steelers, Panthers and Fighting Irish fan, he enjoyed playing cards and loved to fish. However, all of these pastimes took a back seat to spending time with his grandchildren. Albert is survived by his beloved wife Monica; daughters Lisa (Edward) Zalewski of Monaca, Melissa (Dave “Bubba”) Ryckman of Sutersville and Christina (Kevin) Falk of Jefferson Hills; grandchildren Michelle, Tammy, Brenda and Amanda Zalewski, Joshua (Kelsey “that girl”), Zachary, Emily and Elyssa Ryckman, and Kevin Jr., Collin and Cassidy “Crazy” Falk; brothers and sisters Mario, Fred (Jean), and Anthony, all of Clairton, Margaret (Duane) Black of Middletown and Mary (Vince) Viviano of Washington; nieces and nephews; great-nieces and great-nephews. Visitation will be Wednesday from 2 to 4 and 7 to 9 p.m. at Willig Funeral Home & Cremation Services in McKeesport.Mass of Christian Burial will be Thursday, February 24, 2011, at 10 a.m. at Holy Family Church in West Newton with Father John Sweeney and Father James Bump as concelebrants. Friends and family are requested to meet Thursday morning at the church. We sadly report the death of our classmate's husband. Frank Sgro, Jeanette D'Emidio's husband, died on Monday, June 20, 2011. 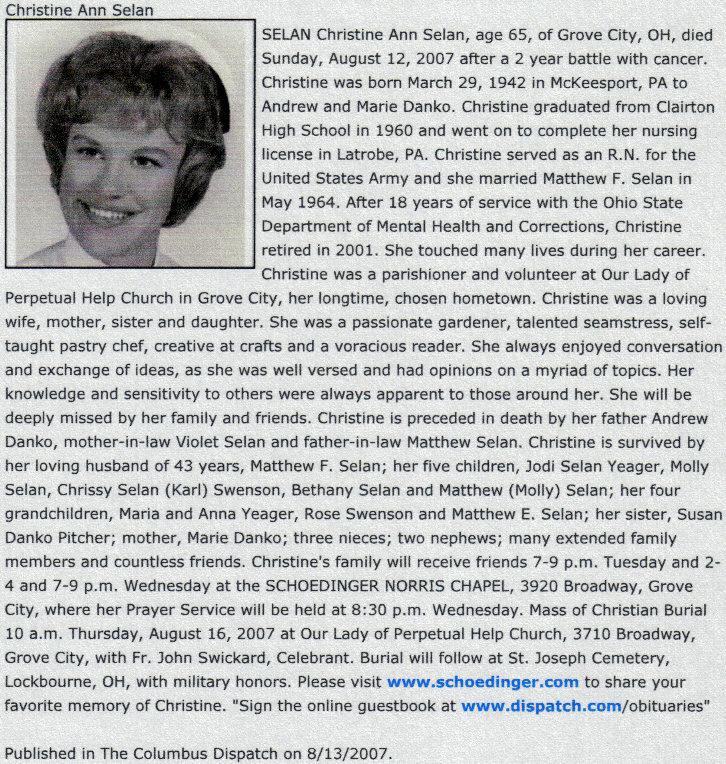 See the obituary below from the McKeesport Daily News. Francis A. "Frank" Sgro, 70, of Mt. Lebanon, died Monday, June 20, 2011. He was the husband of the late Jeanette (D'Emidio) Sgro; devoted father of Lee Anne, Julie L., Christopher L., Tammy J. and Brian J. Sgro; loving grandfather of Shayna Marie, Hunter, Stefano, Jasmine, Abigail and Keegan Dean; also survived by nieces and nephews. Frank loved to travel, he also enjoyed spending time with family and friends who will be welcomed from 2 to 4 and 6 to 8 p.m. Thursday at LAUGHLIN MEMORIAL CHAPEL, 222 Washington Road, Mt. Lebanon. Mass of Christian Burial will be celebrated at 10 a.m. Friday in St. Winifred Church. Interment in St. Clare Cemetery, Clairton. In lieu of flowers, memorials may be made to the American Cancer Society, 320 Bilmar Drive, Pittsburgh, PA 15205 or St. Winifred Church, 550 Sleepy Hollow Road, Pittsburgh, PA 15228. www.laughlinfuneralhome.com. We sadly report the death of our classmate's daughter. Carole Jean Doban Caruthers lost her daughter, Christina Snyder, on Monday, November 8, 2010. The following obituary appeared in The Daily News on Wednesday, November 10, 2010. CHRISTINA SNYDER. Christina C. Snyder, 40 of Jefferson Hills, died Monday, November 8, 2010, in UPMC Shadyside. She was born August 29, 1970, in Schaumburg, Ill., daughter of Carole J. Doban Caruthers and the late T. Blaine "Rolo" Caruthers. She was a registered nurse in the cardiovascular unit of Jefferson Regional Medical Center. She was a member of Pleasant Hills Community Presbyterian Church. She was president of Jefferson Elementary PTA, a Sunday school teacher at her church and a supporter of Thomas Jefferson youth sports. She is survived by her husband Scott H. Snyder; mother Carole Caruthers of Elizabeth; daughter Jordan Snyder at home; son Alex Snyder at home; sister Nicole Caruthers of Homestead; brother Blaine C. (Melissa Dawson) Caruthers of Rostraver; aunt Bernadette Doban of Rostraver; mother-in-law and father-in-law Howard and Faith Snyder of North Huntington; brother-in-law and sister-in-law Todd and Amy Snyder of North Huntingdon; grandfather-in-law J. Howard Snyder of West Mifflin; aunts, uncles and cousins. Family requests donations to the American Cancer Society, SW Region, 320 Bilmar Drive, Pittsburgh, PA 15205. It is with deep sadness that we report the death of our fellow classmate, William J. Halt, on Wednesday, July 7, 2010. 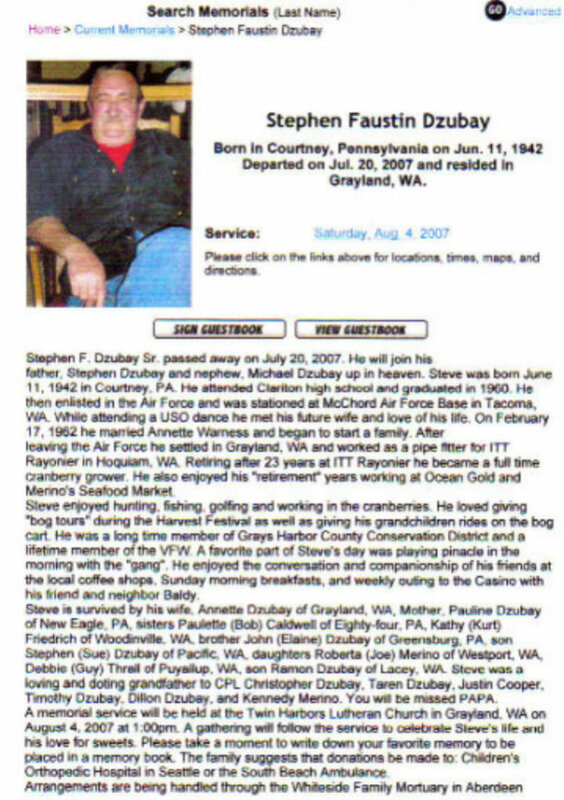 The following obituary appeared on the Bekavac Funeral Home website on July 8, 2010. WILLIAM J. HALT. William J. Halt, age 67, of Forward Township, passed away on Wednesday, July 7, 2010 in Jefferson Regional Medical Center. He was a retired turn foreman for U.S. Steel's Clairton Works and a U.S. Army veteran. Born September 30, 1942 in McKeesport, he was a son of the late William J. Halt, Sr. and Helen Layko Halt. He is survived by his wife of forty-two years, Corrine Anderson Halt; daughter, Angela (Jeremia) Conradie of Columbia, SC, son, Richard A. Halt of West Elizabeth; granddaughters, Isabelle Conradie and Alexandra Conradie; sister, Norma J. Kerr of Forward Township; brother, Duane R. (Diane) Halt of Liberty Borough; also, nieces and nephews. Friends will be received in the Paul E. Bekavac Funeral Home, Elizabeth on Saturday, July 10th from 2-6 PM. No services are scheduled. The family requests memorial contributions be made to American Cancer Society, SW Region, 320 Bilmar Drive, Pittsburgh, PA 15205. It is with deep sadness that we report the death of our fellow classmate, Ronald A. Knight, on Friday, May 14, 2010. 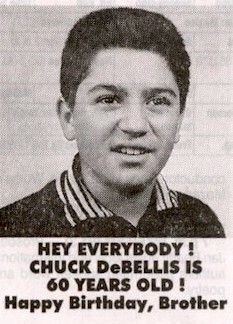 The following obituary appeared in the May 15, 2010 edition of The Daily News. RONALD KNIGHT. Ronald A. Knight of Pittsburgh passed away Friday, May 14, 2010. He was preceded in death by his parents Arthur W. and Janet Keller Knight. Ron grew up in Clairton and later raised his family in nearby Elizabeth. He worked as an electronic/telecommunications technician for Equitable Gas in Pittsburgh, and enjoyed coaching baseball, football and wrestling for many years for the Elizabth Forward Athletic Association. He was a member of the Allegheny Center Alliance Church on the North Side. He was the beloved father of Ronald "Eric" (Stephanie) Knight, Rhonda (Ted) Ringenbach, Jason (Jennifer) Knight and Brittney Johnson-Knight; grandfather of Steven, Sara, Joseph, James, Molly, Andrew, Alex, Johnny and Eric. Friends will be received Monday from 2 to 4 and 6 to 8 p.m. and Tuesday from 10 to 11 a.m. in Stephens Memorial Chapel, 600 Cedar Ave., Pittsburgh, Pa., 15212, where services will be Tuesday, May 18, 2010, at 11 a.m. Interment will follow in Round Hill Cemetery. In lieu of flowers, the family suggests a donation to Allegheny Center Alliance Church, 250 East Ohio St., Pittsburgh, Pa., 15212. It is with deep sadness that we report the death of our fellow classmate, Andrea Lee Papson Olar on Monday, November 23, 2009. The following obituary appeared in the November 24, 2009 edition of The Daily News. ANDREA OLAR. Andrea Lee (Papson) Olar, 66, of Jefferson Hills, died Monday, November 23, 2009, in Jefferson Hills. She was born in Allegheny County, December 21, 1942, daughter of the late Andrew and Kathryn (Roberts) Papson. She was a former resident of Clairton and Philadelphia. Prior to retirement, she had been employed by Guardian Glass Co., in West Elizabeth/Floreffe, where she worked in the supply department. She also was a former greeter at Wal-Mart in West Mifflin. In addition to her parents, she was preceded in death by two brothers, John and James; and a sister, Patricia Nero. She is survived by two brothers, Andrew (Elaine) Papson of Clairton, and Frederick "Fritz" Papson of Clairton; her caregivers, niece and husband, Cindy (John) Latine of Jefferson Hills, with whom she resided; and many nieces, nephews, great-nieces and great-nephews. Friends will be received Wednesday from 9 to 11 a.m. in the S.M. Finney Funeral Home, 432 N. Sixth St., Clairton, where service will begin at 11 a.m. Interment in Round Hill Cemetery, Elizabeth Township. It is with deep sadness that we report the death of Richard Martin, husband of our fellow classmate, Dorothy Poziviak Martin, on Tuesday, May 12, 2009. The following obituary appeared in the May 14, 2009 edition of The Daily News. RICHARD MARTIN. Richard J. "Boats" Martin, 67, of West Mifflin, died Tuesday, May 12, 2009, in the Center for Compassionate Care in Mount Lebanon. He was born September 24, 1941, in McKeesport, the son of the late Leonard W. and Ann D. Stupar Martin. He was a retired policeman for Allegheny County stationed in South Park. He was a member of Holy Spirit Parish in West Mifflin. He was a U.S. Army veteran. He was the former Public Safety Director and assistant Public Safety Director in Clairton and a security guard for the Department of Energy. He was a member of the Fraternal Order of Police Lodge No. 91, Allegheny County Police Association, Boroughs and Township Police Association and American Legion Daniel Keffer Post 75 of Clairton. He is survived by his wife Dorothy "Dee" M. (Poziviak) Martin; daughters Renee' (Rodney) Taylor of Finleyville and Deborah Hamilton of Whitehall; son Richard J. Martin Jr. of Nashville, Tenn.; brothers Leonard F. Martin of Oklahoma and James R. Martin of West Mifflin; stepson Jan M. Hrabosky of Colorado Springs, Colo.; stepdaughter Michele L. Palma of Canonsburg; stepson Robert D. Hrabosky of Elizabeth Township; eight grandchildren; six great-grandchildren; also survived by eight step-grandchildren, nieces, nephews, aunts and uncles. He was predeceased by his first wife Phyllis J. (Slavick) Martin in 1991. Visitation will be today from 6 to 9 p.m. and Friday from 1 to 4 and 6 to 9 p.m. in the A.J. Bekavac Funeral Home, 555 Fifth Street, Clairton, PA., 15025. Mass of Christian Burial will be Saturday, May 16, 2009, at 10 a.m. in Holy Spirit Parish in West Mifflin with the Rev. John B. Lendvai officiating. Burial is in Jefferson Memorial Park, Pleasant Hills..
Memorial contributions can be made to Hillman Cancer Center Development, UPMC Cancer Pavilion, 5150 Centre Ave., Suite 1B, Pittsburgh, PA. 15232. It is with deep sadness that we report the death of our fellow classmate, Jeannette D'Emidio Sgro, on Tuesday, September 2, 2008. Jeannette was diagnosed with pancreatic cancer on May 22, 2008. Jeannette did not feel that chemo was an option for her. Instead she and Frank went to Massachusetts to learn about a macro biotic diet. They were eating greens, beans, brown rice, fish, some sea vegetables and miso soup, plus twig tea. In Jeannette's own words, "No chemo poisons for this person." In a recent correspondence to Andy Nixon, Jeannette said, "I'm seeking a miracle. If that comes fine, but if not, see you on the other side." She also said, "Don't worry about me, I'm fine with all this. Thanks for your good wishes. One can never have too many good wishes or too many prayers." Personally, I spoke with Jeannette several times about all this. She was emphatic that her faith would carry her through it. She displayed to me a very strong person who was willing to take whatever was in store, someone who was not going to give up easily, but she would accept her fate and wanted it to be as dignified as possible. We will all miss her terribly. SGRO JEANNETTE D. Age 66, Of Castle Shannon, on Tuesday, September 2, 2008. Beloved wife for 41 years of Frank A. Sgro; loving mother of Lee Anne Sgro (Antonio Sergio), Julie Sgro, Chris (fiancee Shannon) Sgro, Tammy Sgro and Brian (Amber) Sgro; sister of Toni Mastrangelo (Jim); grandmother of Shayna, Hunter, Stefano, and Jasmine; also survived by nieces and nephews. Friends may call LAUGHLIN MEMORIAL CHAPEL,222 Washington Road, Mount Lebanon, THURSDAY & FRIDAY 2-4 & 6-8pm. Mass of Christian Burial will be celebrated Saturday at 10am in St. Winifred Church. Interment St. Clare Cemetery. In lieu of flowers memorials may be made to Saint Winifred Church, 550 Sleepy Hollow Road, Pittsburgh, PA. 15228 or Prime Time Adult Care Inc. 44 Highland Road, Bethel Park, Pennsylvania 15102. www.laughlinfuneralhome.com Send condolences at post-gazette.com/gb. It is with deep sadness that we report the death of our fellow classmate, Don Britton, on July 28, 2006. Adele got this information from Don's daughter after our most recent mailing (June 2008). Don's address had been to a nursing home in Largo, Florida. His daughter informed us of his death. I tried to do a search and found a listing in the St. Petersburg Times for July 29, 2006, but could not get any additional information through that source. I have contacted Don's daughter to see if she can provide an obituary. I will keep you posted. Note from Anna Marie: I spoke with Don Britton's daughter, Erin Hughes, on Thursday evening, June 12, 2008. She told me that Don had heart disease and in November of 2004, he had a double bypass. In June of 2005, Don had a stroke and was then at the nursing home. In October of 2005, Don's bypass closed, they had to give him a stint, and he was diagnosed with dementia. In July of 2006, Don had another stroke and died about five days later, on July 28, 2006. Don's daughter Erin sounds like a lovely woman, she is 34 years old and has one daughter. Don has two other daughters, Kara (38) and she also has one daughter; Heather will be 40 in September of 2008 and she has six daughters. So...Don has eight granddaughters and he loved them all very much. Erin has promised to send the obituary and a picture of Don. I expressed our deepest sympathy from all of Don's classmates. I'll post the obituary and picture as soon as I get them. I regret to inform you that my father, Joe Ancrile, passed away on May 14th, 2008. It is a tremendous loss to our family and friends. My dad was an amazing man who touched the lives of so, so many. I know that he attended a reunion in 2000 and another one a couple of years ago at Fort DeSoto Park, and I thought that you may want to post this information on your site. Moss Feaster Funeral Home of Dunedin, FL has my dad listed on their memorial website which can be accessed through www.mem.com. Joseph Daniel Ancrile, age 65, of 2387 Lake Heather Hts. Ct., Dunedin died Wednesday, May 14, 2008, at Mease Countryside Hospital surrounded by family and friends. Joe was born June 25, 1942, in East Liverpool, Ohio, the son of Joseph and Olga Ancrile. He spent his boyhood years in Midland, PA and in Clairton, PA. He graduated from West Virginia Wesleyan College and later completed his graduate work at West Virginia University and Ohio University. Joe taught at high schools in Parkersburg, WV and Elizabeth, WV. He retired to Florida in 2003. Over the years, Joe expressed interest in a variety of pursuits including classical guitar, golf, chess, and bridge. He was a member and past-president of the Clearwater Duplicate Bridge Club. He was also editor of the club’s monthly newsletter. Joe’s greatest passion was his love of the Lord and his devotion to living out his faith through teaching, counseling, and encouraging those with whom he came into contact. He was a member of Clearwater Community Church and was also on the Board of Directors of the C. S. Lewis Society, a group dedicated to helping skeptics doubt their doubts. Joe is survived by his wife of 25 years, Karen; his son Jeff Ancrile of Vienna, WV; his daughter Jayne Plauche of St. Petersburg, FL; his step-son Patrick Dailey of Manila, The Philippines; his step-daughter Mary Beth Dailey of Arlington, VA; his step-son John Dailey of Portland, ME; his sister Leila Kayser of Brandon, FL; his nephew Jonathan Kayser, also of Brandon; and his grandchildren Jillian and Jack Plauche of St. Petersburg, FL. CHOTTINER, CHARLOTTE DIANA. On Monday, May 7, 2007, Age 85 and a lifetime resident of Clairton, PA where she was a school teacher for 34 yrs. She is survived by her sister Sylvia (Moe) Lampenfeld of Oakland. Nephews Myles and Gregg. Nieces Judy, Dena, Marcia and Anita. Sisters-in-law Esther and Florence Chottiner. She is prec-deceased by brothers Jacob and Louis Chottiner. A graveside service was held Wednesday at the Gemilas Chesed Cemetery in White Oak. Arrangements were handled by the A.J. Bekavac Funeral Home, 555 Fifth St., Clairton, PA 15025. Memorial contributions can be sent to the Library for the Blind and the Physically Handicapped, 4724 Baum Blvd., Pgh., PA 15213. It is with deep sadness that we report the death of Daniel McCormick , 87, of Clairton, on Friday, March 14, 2008. You may remember that Mr. McCormick was a Shop Teacher at Clairton High School and attended many of the CHS Reunion Picnics, the most recent of which was on Saturday, September 1, 2007. 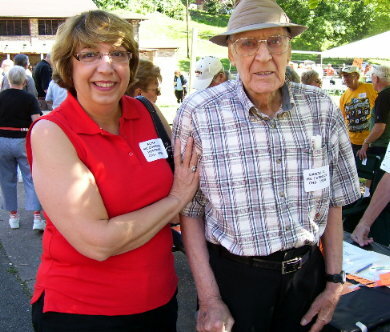 Here is a picture of Dan McCormick and his daughter, Alma Hoffman, at the picnic last summer. The following obituary appeared in the McKeesport Daily News on Saturday, March 15, 2008:. DANIEL McCORMICK. Daniel C. McCormick, 87, of Clairton, died Friday, March 14, 2008, at the Senior Care Plaza in McKeesport. He was born June 17, 1920, in Clairton, son of the late Charles and Edna Johnston McCormick and husband of the late Alma R. (Thompson) McCormick who died Nov. 7, 1997. He retired after 35 years as a shop teacher for the Clairton School District. He was a member of the First Presbyterian Church of Clairton and a graduate of California State Teachers College. He was a 1938 graduate of Clairton High School and enjoyed wood carving and was known for his mallard duck carvings. He was a U.S. Army Air veteran serving in World Ward II. He is survived by daughter Alma (Dale) Hoffman of Elizabeth Township; sons Daniel C. (Christine) McCormick of Huntsville, Ala. and John C. (Lisa) McCormick of Jefferson Hills; seven grandchildren; two great-grandchildren; also nieces and nephews. Friends will be received today from 5 to 9 p.m. and Sunday noon to 4 and 6 to 9 p.m. at the A.J.Bekavac Funeral Home, 555 Fifth St., Clairton, Pa., 15025. Religious Service will be Monday, March 17, 2008, at 11:30 a.m. at the A.J. Bekavac Funeral Home Chapel, Clairton with the Rev. John MacLeod officiating. Burial is in Jefferson Memorial Park, Pleasant Hills. It is with deep sadness that we report the death of our fellow classmate, Patty Veres Milas, on Monday, October 16, 2006. After someone told Anna Marie that Patty had died, Bob White was able to verify her death through his sources. I was unable to find an obituary in the Pittsburgh Tribune-Review or the Pittsburgh Post-Gazette. However, after doing a search in the McKeesport Daily News, I found the listing of the name and the date of death - no further information. Some of you may know that Patty had been at Mitchell Manor in Clairton after a series of strokes. I called Mitchell Manor on Thursday, 3/13/ 2008, and they told me that Patty had been transferred to Jefferson Hills Nursing Home a while ago and from their memory, she had died about a year earlier. That started the search of the newspapers and the research by Bob White....Anna Marie 3/16/2008. Florida Reunion Picnic. There is an annual reunion picnic of all Clairton High School graduates held in Florida. 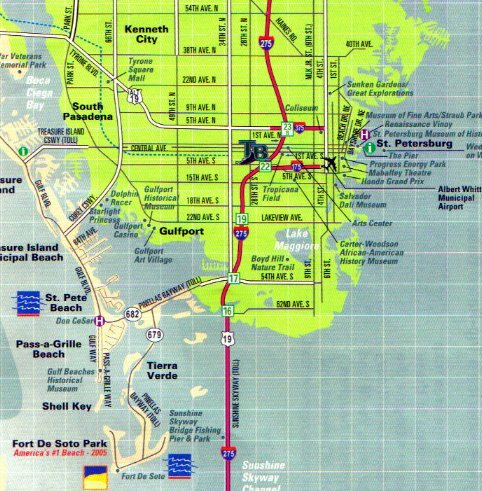 The picnic is held at Fort DeSoto Park near St. Petersburg every year on the third Saturday of February. People arrive about 10 or 11:00 a.m. Bring your own lunch and beverage. It is with deep sadness that we report the death of our fellow classmate, Alex Ross, on Tuesday, November 13, 2007. The following is his obituary as it appeared in the Sarasota Herald Tribune on Friday, November 16, 2007. Ross, Alessandro Vincent, July 24, 1942 - Nov. 13, 2007: Alessandro Vincent "Alex" Ross, 65, Sarasota, formerly of Clairton, Pa., died Nov. 13, 2007. Visitation will be from 6 to 9 p.m. today at Toale Brothers Funeral Home, Colonial Chapel. A Mass will be offered at 11:15 a.m. Saturday at St. Martha Catholic Church. 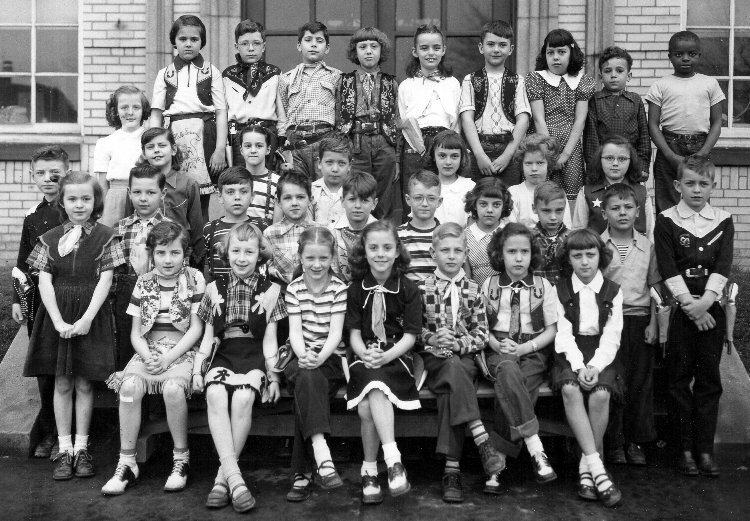 Survivors include his wife, Marian; daughters Alexia Jaldung, Aimee Kaiser and Alysia Mitten; a son, Michael; sisters Lucy Wyss, Rita Tremont and Mary Margaret; brothers Vincent, Michael and Thomas; his mother, Genevieve; and six grandchildren, Gabriella, Ross, Nicholas, Max, Caroline and Alexander. He was preceded in death by his father, Mike. Mr. Ross was a member of Elks Lodge 1519, the Sarasota Sailing Squadron, American Legion Post 75 and the Fraternal Order of the Eagles 2487. Memorial contributions may be made to St. Martha Catholic School, 4380 Fruitville Road, Sarasota FL 34232. It is with deep sadness that we report the death of our fellow classmate, Sam Lauderbaugh, on Wednesday, October 31, 2007. Sam's obituary as it appeared in the McKeesport Daily News on Thursday, November 1, 2007: SAMUEL LAUDERBAUGH, JR., 65, of North Huntingdon, died suddenly Wednesday, October 31, 2007. He was born December 10, 1941, in McKeesport, a son of the late Samuel B. and M. Helen Tipping Lauderbaugh Sr. and was also preceded in death by a son, Samuel B. III, and a brother, William G. Lauderbaugh. Sam was a retired employee of Schering-Plough Pharmaceuticals of Kenilworth, N.J., a member of First Presbyterian Church in Irwin and served as the assistant Scoutmaster for the Boy Scout troop that met there, and was a member of the Irwin Lions Club. He is survived by his wife, Charlene Brannan Lauderbaugh; a son, Rob Lauderbaugh of York; and a niece and nephew. Friends will be received Friday from 2 to 4 and 7 to 9 p.m. at the William Snyder Funeral Home, 521 Main Street, Irwin. A funeral service will be held Saturday, November 3, 2007, at a time and place to be announced with the Rev. Dr. Ronald Wakeman officiating. Interment will be in Jefferson Memorial Park in Pleasant Hills. Kenneth Andrew Popcak, 65, of Elizabeth Township, died Saturday, Sept. 29, 2007, in UPMC McKeesport. He was born April 6, 1942, in McKeesport to the late Andrew and Ann Vossel Popcak and was the former owner of Ken's Creative Photography and a member of St. Clare of Assisi Parish, Clairton. Mr. Popcak was a CCD teacher, a Eucharistic minister and co-leader of Holy Trinity Youth Group and several prayer groups in the area. He was a former choir member at St. Clare of Assisi Parish; a memb er of C.M.F. Men's Group at St. Martin de Porres Parish, McKeesport; active in a family puppet ministry, and "a joyful noise" for many years. Husband of 42 years of Elaine Marie (Hirosky) Popcak. Father of Gregory Popcak (Lisa), of Steubenville, Ohio. Grandfather of Jacob, Rachael and Liliana Popcak. Visitation from 2 to 4 and 6 to 9 p.m. Monday at the A.J. BEKAVAC FUNERAL HOME, 555 Fifth St., Clairton. Mass of Christian Burial at 11:30 a.m. Tuesday in St. Clare of Assisi Church, Reed Street. It is with deep sadness that we report the death of our fellow classmate, Stephen Faustin Dzubay, on Friday, July 20, 2007. Andy Nixon found his obituary on the internet - Whiteside Family Mortuaries (obituary follows). E-Mail from Margie Brenner Porreco on 8/29/2007: "It saddens me to report the passing of Sally [Gilmore Rosche]. It's a small world as two girls from Walnut Ave. School ended up living about 2 miles away in Santa Maria, California. Sally sought me out and I did get to spend some time with her. She had such a zest for life in spite of all her health issues. Arrangements are under the direction of Dudley-Hoffman Mortuary and Crematory (805)922-8463. Visitation will take place on August 29 and a funeral service will be held on Thursday, Aug. 30." E-Mail from Andy Nixon on 8/16/2007: "I have been in recent contact with Roy Potts, brother of classmate Robert Potts. Robert passed away January 21, 2004 in San Leandro, CA where he had been residing. He'd had a stroke but seemed to be recovering. He is survived by Roy (Los Angeles) as well as his two sisters who live in San Leandro. I've Googled newspapers in the San Francisco bay area including San Leandro, but have not been able to find his obituary." It is with deep sadness that we report the death of our fellow classmate, Christine Danko Selan, on Sunday, August 12, 2007. Note from Anna Marie on 8/12/2007: I received the following e-mail from Chris's husband, Matt, this morning. "Chris passed away this morning at 1:30 A.M. She died peacefully in her sleep. I will pass on the arrangements as soon as I get them set up. Please Pray For Her. Matt Selan"
It is with deep sadness that we report the death of our fellow classmate, Michael Rothbauer, on Tuesday, June 5, 2007. MIKE F. ROTHBAUER, Clairton. Mike Francis Rothbauer, 64, of Clairton, died Tuesday, June 5, 2007, at home. He was born July 10, 1942, in Elrama to Mary (Albert) Seach Rothbauer, of Jefferson Hills, and the late Frank Rothbauer and was a retired shipper for Eastman Chemical, formerly Hercules, PICCO, West Elizabeth and a member of St. Clare of Assisi Parish, Clairton. Mr. Rothbauer was a Vietnam War Marine Corps veteran who attained the rank of corporal, enjoyed hunting with his sons and grandsons and had a love for NASCAR and youth baseball and football. Also surviving are his wife of 43 years, Lorraine (Paugh) Rothbauer; sons, Michael Rothbauer (Mary J.) of McKeesport, and Mark Rothbauer (Mary B. ), of Ross, and grandchildren, Thomas, Randy, Rachael, Tyler and Carly. Visitation from 1 to 4 and 6 to 9 p.m. Friday at the A.J.BEKAVAC FUNERAL HOME, 555 Fifth St., Clairton. Mass of Christian Burial at 10:30 a.m. Saturday in St. Joseph Building of St. Clare of Assisi Parish. Memorial contributions may be made to the National Kidney Foundation, 555 Grant St., Suite 317, Pittsburgh, PA 15219; the American Cancer Society, 320 Bilmar Drive, Pittsburgh, PA 15205, or Family Hospice and Palliative Care, 50 Moffett St., Pittsburgh, PA 15243. It is with deep sadness that we report the death of our fellow classmate, Anna Van Horn, on Monday, December 11, 2006. Rev. Lee Weber found the obituary in his local newspaper on December 13 (the day before Anna's funeral) and visited the funeral home as a representative of our class. Lee said "I went to Anna VanHorn's funeral and met her daughter. She looks exactly like her mom did. Anna moved out of Clairton back to Sharon right after graduation." Lee said he claified for them about the high school thing. Here is the obituary that Lee forwarded for notification to our classmates. Anna Marie 12/21/2006. From The Herald, Sharon, PA, Wednesday, Dec. 13, 2006. Obituary - Anna F. VanHorn Scruggs Cogley. Mercer resident retired from GE, excelled at crafts. A memorial service wil be held Thusday for Anna F. VanHorn Scruggs Cogley of 740 E. Market St., Mercer. She passed away at 2:25 p.m. Monday, Dec. 11, 2006, in Grove City Medical Center, Pine Township, after an extended illness. She was 64. Mrs. Cogley was born May 21, 1942, in Sharon to Thurman and Thelma Coryea VanHorn. She graduated in 1960 from Jefferson High School, Clairton, Pa. Anna was employed as a diesel mechanic at General Electric Co., Grove City and Pine Township, retiring in 2002 after 37 years of service. She was a member and past president of the Ladies Auxiliary to Veterans of Foreign Wars Post 7599, Reynolds. She was also a past president of District 3 of V.F.W. Ladies Auxiliary. She was very supportive of Cool Spring Township Fitness Club, where she was a member. She was very creative, artistic and talented with her hands and enjoyed all types of arts and crafts. Her first husband, Richard Scruggs, preceded her in death in September 1996. In July, 1975, she married Ed Cogley. He preceded her in death in June 1990. She is survived by: her daughter, Rickie Ann Nearhoof and her husband Houston Nearhoof Jr., Sharon; four stepchildren, Sharon Weaver and her husband Doug, Jackson Center; Richard Cogley and his wife Mary Ann, Germany; Russel Cogley, Reading, Pa.; and Donald Cogley and wife Deb, Fredonia; a sister, Martha Pat Cheiro and her husband Larry, Chicago; a stepbrother, James Lonkowske, Hadley; and 15 grandchildren and 13 great-grandchildren. In addition to her husbands, she was preceded in death by her parents; a stepbrother, David Lonkowske, two stepchildren, Thomas Cogley and Edward Cogley Jr.; a granddaughter, Brandee Simpson; and two great-grandchildren, Maddison and Austen Nearhoof. Memorial contributions may be made to American Cancer Society, 3208 Wilmington Road, New Castle 16105. COGLEY, Mrs. Ed (Anna F. Van Horn Scruggs), 64, of 740 E. Market St., Mercer, PA. CALLING HOURS: 10 a.m. to time of service Thursday (12-14-06) in Stevenson-Webb Funeral Home, 1142 Ridge Ave., Sharpsville. Friends may send condolences to stevenson-webbfh@aol.com. SERVICE: Memorial service at 11 a.m. Thursday in the funeral home with the Rev. John M. Trojak, pastor of First Baptist Church, Sharon, officiating. INURNMENT: Hillcrest Memorial Park, Hermitage. It is with deep sadness that we report the death of our fellow classmate, Charles Rossi, on Tuesday, May 31, 2005. The following obituary appeared in the Toledo Blade on June 3, 2005. Obituary - ROSSI, Charles, age 63, of Perrysburg, passed away on Tuesday, May 31, 2005 at St. Luke's Hospital. He was born on April 4, 1942, to Domenic and Philomena (Nese) Rossi in Braddock, PA. Charles was a graduate of Brigham Young University and served his country in the US Army during the Vietnam Era. He was employed by WTOL Toledo 11 News as an account executive. Surviving are his mother, Philomena Rossi,; son, Stephen Rossi of Toledo; daughters, Gina and Jennifer Rossi of Columbus; grandson, Bhaschand Rossi Davis of Columbus; brother, Ronald (Mary) Rossi of Elizabeth, Pennsylvania; nephew, Nathan Rossi of Pittsburgh, PA. Charles was preceded in death by his father, Domenic Rossi. Friends may visit at the Sujkowski Funeral Home of Rossford, 830 Lime City Rd., on Friday, June 3, 2005, from 2-8 p.m. Funeral services will be held on Saturday at 10:00 a.m. in the funeral home with Rev. Jonathan Wight officiating. Interment will follow at Woodlawn Cemetery. It is with deep sadness that we report the death of our fellow classmate, Donald V. Salvino, on Sunday, April 24, 2005. The following obituary appeared in the Pittsburgh Post-Gazette on Wednesday, April 27, 2005. Obituary - SALVINO, DONALD V. Age 62 of Upper St. Clair on April 24, 2005; beloved husband of Janis A. (Youngman); loving father Kristen and Derek; dear brother of Connie (Lawrence) Levander of Belle Vernon; beloved son of Victor M. Salvino and the late Evelyn M. Salvino; uncle of Gregory (Erika) Levanda and Tricia Levander. Donald retired from U.S. Steel with 35 years of service and is currently employed by Dixie Pipe Sales. Visitation will be from 5-9 pm on Wednesday at the Jefferson Memorial Funeral Home, Inc., 301 Curry Hollow Rd., Pleasant Hills. A Mass of Christian Burial will be celebrated at St. John Capistran Catholic CVhurch in Upper St. Clair at 11:00 am on Thurs. Entombment in Jefferson Memorial Park. In lieu of flowers memorial contributions may be made to Family Hospice and Palliative Care, 250 Mt. Lebanon Blvd., Suite 203, Pgh. PA 15234 or UPMC Hillman Cancer Center, 3rd Floor, 5115 Centre Ave., Pgh., PA 15232. It is with deep sadness that we report the death of Virginia N. Furno on Monday, December 22, 2003. The following obituary appeared in the Pittsburgh Post-Gazette on Sunday, January 4, 2004. Obituary - Furno, Virginia N. On Monday, December 22, 2003, of Whitehall. Wife of the late Joseph R. Furno. Funeral services were held privately. Arrangements were made by the John F. Slater Funeral Home, Inc. Virginia was a graduate of Wilson College, did graduate work at Carnegie Tech (now CMU), and received her master's degree at the University of Pgh. She participated in many community affairs. She was a volunteer and auxilion at Jefferson Hosp. ; a member of the Brentwood Presbyterian Church (to whom she donated the Carillon); a member of Friends of Whitehall Library, Syria Ladies Social Club, Brentwood Century Club, Syria Temple Automobile Club and a charter member of AARP #2050. If desired contributions may be made to Brentwood Presbyterian Church or Wilson College 1015 Pennsylvania Ave. Chambersburg, PA 17201. It is with deep sadness that we report the death of Donna Marie Lancianese Lajcak's dad, Romolo "Roman" Lancianese on Thursday, January 1, 2004. The following obituary appeared in the Pittsburgh Post-Gazette on Saturday, January 3, 2004. Obituary - Romolo "Roman" Lancianese. On Thursday, January 1, 2004, age 93, of Clairton, PA, retired proprietor of TheVillage Inn of Clairton; husband of the late Rose Marie Patitucci Lancianese; father of Donna Marie (Denis) Lajcak, Ramon "Ray" and Perry Lancianese and the late Gloria Jean Vajey; grandfather of Patrick Vajey; brother of Herb Lancianese and the late Homer, William and Serafino Lancianese; cousin of Sandy Urbanski and Carl Piccioni; brother-in-law of Eleanor Ricci Lancianese and Joan Comondar Lancianese; also survived by 11 nieces; four nephews and 23 grand nieces and nephews. Friends received in the A.J. Bekavac Funeral Home, 555 5th St., Clairton, 412-233-5700 on Sunday, 2-4 & 7-9 and Monday from 8:30 a.m. until time of prayers at 9:30. Mass of Christian Burial, Monday, 10 a.m. in St. Paulinus Church, Clairton, PA. Memorials may be made to St. Francis University, 117 Evergreen Dr., Loretto, PA15940 or the Statue of Liberty/Ellis Island Foundation Inc., 292 Madison Ave., New York, NY 10017. It is with deep sadness that we report the death of John A Heidrick. The following obituary appeared in the Pittsburgh Post-Gazette on Monday, July 14, 2003. HEIDRICK, John A. Age 61, of Scott Twp., peacefully on Sat., July 12, 2003, beloved husband of Susan Jason-Heidrick; loving son of Mary and the late John Heidrick; brother of James Heidrick; step-father of David and Stephen Jason. John was a 22 year employee of the U.S. Postal Service. He served in the Air Force and was a member of Germania Lodge #509 F&AM. Friends welcome Tues. 3 p.m. until time of service at 7:30 p.m. at William Slater II Funeral SVC., 1650 Greentree Rd., Scott Twp. In lieu of flowers, family requests memorial contributions be made to American Heart Assoc., 10 Duff Rd., Suite 304, Pgh. PA 15235 or the American Diabetes Assoc., P.O. Box 2680 N. Canton, OH 44720. It is with deep sadness that we report the death of Ron Galloway on Saturday, December 21, 2002, in Utah. Andy Nixon has provided a copy of Ron's obituary from the local newspaper, The Daily Herald. Good news this time! I received an e-mail from Bob Orsini giving us his e-mail address, as well as his mailing address. Bob had been on our "missing" list and we are so pleased to add him to the "found" category. Check out the e-mail directory for Bob's address...you might want to send him an e-mail welcoming him back into the crowd.... We hope to see Bob at the next reunion! It is with deep sadness that we report the death of Nick Jordan, husband of our classmate Jean Gazda Jordan. Nick died on Friday, June 29, 2001, in Canton, GA. Nick was a 1959 graduate of Clairton High School. 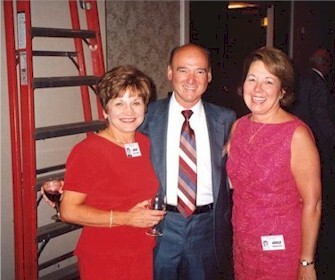 Jean Gazda Jordan, Nick Jordan, and Adele Henning Kunz at the Reunion Banquet on July 8, 2000. It is with deep sadness that we report the death of Kenny Laughlin on Monday, April 9, 2001, at work in Clairton from a heart attack. The following obituary appeared in the McKeesport Daily News on Tuesday, April 10, 2001: KENNETH JAMES LAUGHLIN, 59, of Union Twp., died yesterday in Jefferson Hospital. A carpenter for the Clairton plant, U.S. Steel Corp., he was a 1960 graduate of Clairton High School, member of the Tri-County Anglers Association, Union-Finley Football Association, St. Francis of Assisi Parish in Finleyville and its Parish Council and Men's Club. Born in Clairton, July 15, 1941, he was the son of the late Karl K. and Mary Agnes Bickerton Laughlin. He is survived by his wife, Roseann Orsini Laughlin; sons, Mark D., Timothy S. and Aaron M. Laughlin, all at home; sister, Mary Margaret Little of Clairton; and brother, Keith B. Laughlin of Clairton. Friends will be received in the A.J. Bekavac Funeral Home, Clairton, tomorrow from 7 to 9 p.m. and Thursday from 2 to 4 and 7 to 9 p.m. Liturgy of the Word will be celebrated Friday at 10 a.m. in St. Francis of Assisi Church by the Rev. Robert J. Boyle. Kenny Laughlin at the Reunion VFW Mixer on July 7, 2000. It is with deep sadness that we report the death of Bill Tillery on Saturday, November 11, 2000. The following obituary appeared in the Pittsburgh Post-Gazzette on Monday, November 13, 2000: TILLERY, WILLIAM H., Age 57, of Monongahela, on November 11, 2000. Beloved husband of Mary Ellen (Emph) Tillery; loving father of Kimberly Pezzone and Craig William Tillery; brother of James, Eugene and Daniel Tillery; grandfather of Michael, Dominic, Anthony and Gino. Visitation will be 1-4 and 7-9 p.m. on Mon. at the Jefferson Memorial Funeral Home, Inc., 301 Curry Hollow Rd., Pleasant Hills, where a blessing service will be held at 11 am on Tues. Interment in Jefferson Memorial Park. In lieu of flowers, memorial contributions may be made to UPMC Pgh Cancer Institute. The City of Clairton, in conjunction with local veterans organizations and civic groups, is planning the construction of a monument to commemorate the sacrifices made by Clairton's servicemen and women during wartime. Currently, there is no monument or memorial to honor their sacrifice. The planned monument will be erected in front of the Clairton Municipal Building. A walkway of engraved stones honoring those who gave their lives will be placed in front of the monument, along with an honor roll of all Clairton citizens who have served in the military. Donations are now being accepted for this memorial. Checks should be made payable to City of Clairton Memorial Fund and sent to: City of Clairton Finance Office, 551 Ravensburg Blvd., Clairton, PA 15025. It is with deep sadness that we report the death of Penny Pacinda on Monday, March 20, 2000, in Lakeland, Florida. Penny was taken by cancer of the uterus, which eventually spread to the lymph nodes. Penny's only child, Kathleen, said that her mother had been battling the disease for about a year...but the doctors were hopeful. Kathleen said that her mother's last month had been a downward spiral. Penny had been in the hospital for ten days and then in hospice for one week. Kathleen said her mother went peacefully. Penny's husband (Kathleen's father) died about eight years ago of septecemia (? ), a blood infection. Doug is moving to a new home, just two blocks from his old home in Florida. He is planning to marry Tina on February 12, 2000. Congratulations, Doug and Tina, and may you have many years of happiness together in your new home! After a recent victory in the November election, ceremonies were held in Loveland, Ohio, on December 7, 1999, during which Donna became Loveland's Mayor for two years; only the second woman to do so since 1977. Everyone seems to be thrilled about it. I may be performing my first wedding this week that's kind of exciting. PLUS hosting a private gathering at City Hall for our US congressman (Strickland)? on Wednesday, December 8, 1999. Congratulations, Donna!!! !